After my latest post about unit tests integration with buildbot some people asked me how I’ve done it, and got interested in setting up something like that for their own projects. I hope this post helps with this. as appropriate. This is important, because I’ll use this later on, when setting up buildbot, to detect the passed and failed tests. The HAVE_TESTS variable should be set at configure time, after checking we have all the tools we need to build and run the tests, so we can disable the tests in case the systemt does not provide the necessary stuff. We’ll see how to do this in the next section. Ok, now we have to provide an implementation for all those tests. You can use any unit testing framework to implement them (of course, you can decide not to use any framework too, it is up to you). I have used Check for my tests, so I’ll explain how to set up autotools to use it properly. In case you use use a different tool, a similar setup should be needed. $(CHECK_LIBS) and $(CHECK_CFLAGS) are provided by Check at configure time, providing the neccessary libs and flags to compile Check based tests. The AM_PATH_CHECK macro is provided by Check (you might want to add it to your acinclude.m4 file), and is used here to ensure that an appropriate version of Check is installed, setting HAVE_CHECK to True in case it is (and thus, enabling the build of the Check based tests defined in Makefile.am). Do you see the blue line? That’s an Automake output. The lines above that one are Check output stating the result for each unit test executed. It is very easy, really. You can reboot buildbot now to see how it works. Once buildbot finishes to build the project you can see that all you get for the phase that takes care of the tests is a plain text log with the “make check” command stdout. Let’s now see how we can get a better report. The most interesting stuff is in the __init__ method, where we create an observer (UnitTestsObserver) for the stdout log. This means that each time that a new line is output to stdout, that observer will be warned, so it can process it. The getText method provides the text that is shown in the phase box of the Waterfall view of the project. In this case it will show the number of passed and failed tests. 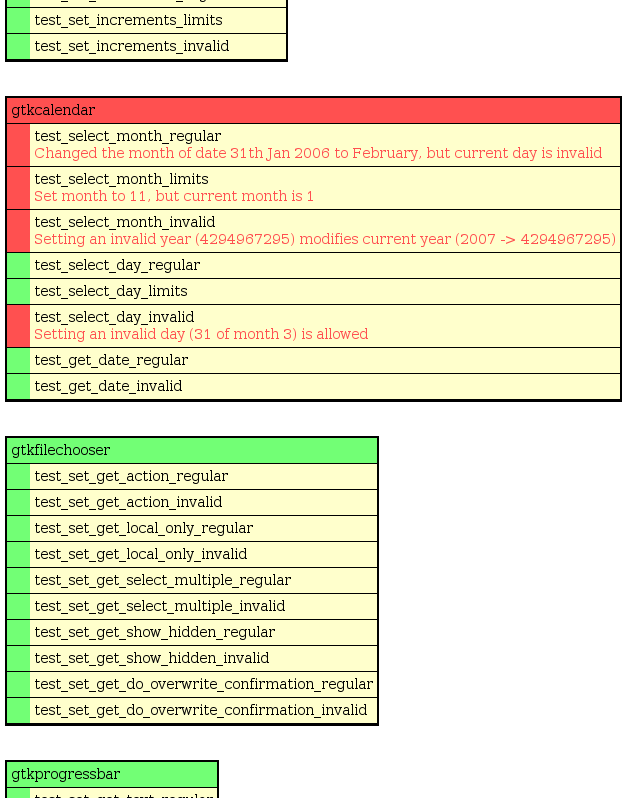 The createSummary method is used to add additional information (for example, extra logs). In this case I use this method to link a new log with the html summary of the tests done. The evaluateCommand method is called when the “make check” command finishes, to decide the final status of the phase. In this case I set the status to “WARNING” (orange color in Waterfallview) when there are failed tests, or SUCCESS otherwise. I could set it to FAILURE if there are failed tests, but I decided not to flag a build as FAILED when there are failed tests. Finally, the createTestsSummary method is used to generate the HTML with the tests summary that is being linked in createSummary. In this method you must create and return a string with the HTML page contents. In this example, test_set_get_action_regular is the name of the unit test, and the last component is “Passed” if the test was successful or an error message otherwise.Thus, I added to the list a regular expression to matches such lines and extracts the interesting information from them. Because Automake does not print its output until all the unit tests of the test program are done, I do not know which test program the unit tests belong to until I get the Automake output. That’s why I keep the matched unit tests in the unittests variable until I match an Automake passed/failed line (at that moment, I add all the unit tests matched to that test program and reset the unittests variable). t is the name of the test program. t is True if it is a passed test or False otherwise. t will be a list with all unit tests executed for that this program. u is the name of the unit test. u is True if it is a passed unit test or False otherwise. u is a string containing the string “Passed” for passed tests or the error message for failed tests. This is all the information that we need to write the HTML report in the createTestsSummary method. In summary, I’ve built a custom build step inheriting from steps.shell.ShellCommand. This custom step will just execute a “make check” command. I also rewrited some methods to customize the information reported once the command is finished. I used the createSummary method to link an HTML log with a personalized tests summary. In order to get all the information that I need to create all these methods (information about the passed and failed tests), I added an observer to the stdout log, that parses each line output by the command execution to stdout looking for Automake or Check messages and storing the relevant information for a later usage. … and that’s all. I really hope this helps you. If you have any suggestion for improving this, I’ll very glad to know! Final note: because I use jhbuild to build gtk+ and its dependencies from buildbot, the code above is not exactly the same I’m using, so it is possible that I missed something or made mistakes. If you find any mistake, please, let me know and I’ll fix it. Using buildbot you can include a “make check” step in your automatic build process.This way you can realize if your tests succeed or fail on each automatic build. This is very useful, along with the option to include references to the commits made to the projet repository, to find out what commit broke something. When something goes wrong with the tests, the first step is to find out what is actually failing. To do this, buildbot provides a complete text log with all the stdout generated by the “make check” command. Although this may be enough for developers, it is not very confortable, you have to explore by hand a complete text log looking for the test(s) that have failed, skipping passed tests and any other kind of (maybe) irrelevant output generated by the tests. In order to make this easier, I’ve playing a little with the gnome-buildbot setup by Dape some time ago, trying to add the capability to parse the tests output and generate a more visual and efficient html report with a summary of the tests and the error messages. This parser looks for strings like: “PASS: ” or “FAIL: “, which are the regular automake output for each test program executed. Besides, I’ve also included support for Check based unit tests, so you can get a detail of each unit tests done for each test program. Let’s see this with an example, in the following image one can see the buildbot automated building of the gtk+ project. 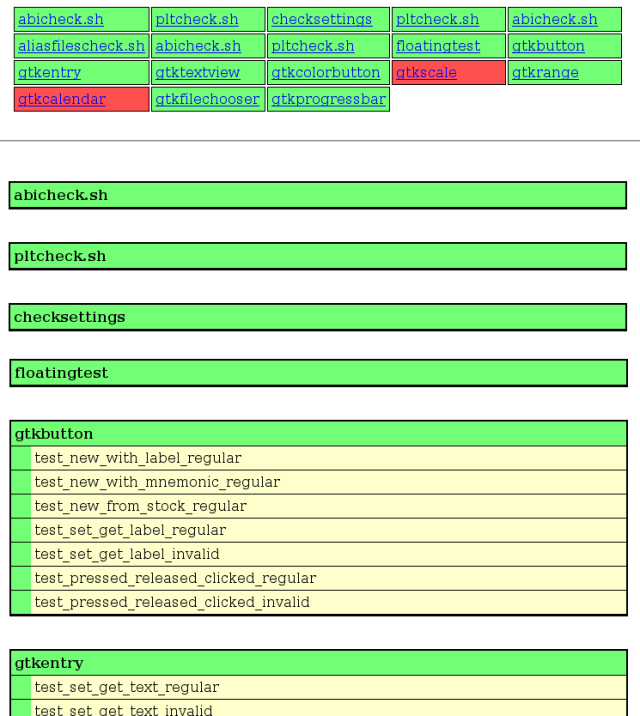 In orange you can see the tests phase, which is actually the result of executing “make check”, previously, I’ve added a set of Check based tests to the project. The orange color of that phase means there are failed tests. Besides the number of passed and failed tests one can see a link to the buildbot plain text stdout log and a link to access the html summary report. In the next image one can see a piece of the html report with the tests summary, which shows one table per test done. The table title is the name of the test as prompted by automake and each table row is a single test (done with Check) in that test program. If you do not use Check for your unit tests, then you’d only get the table titles. Of course, green means test passed, red means test failed ;). In case a test fails, the error message is shown too.